BELMOPAN–When Dr. Omar Figueroa captured the blowout victory for the ruling United Democratic Party in Cayo North a week ago on Monday, January 5, we asked him about the prospects of him also being offered a ministerial post, but he told us that he wanted to just focus on serving the constituency rather than becoming a member of Cabinet. His party leader, Prime Minister Dean Barrow, had also indicated to the press that he did not wish to undertake any Cabinet shuffle to accommodate a ministerial posting for Dr. Figueroa, especially in advance of the March municipal elections – a move which could have no doubt stirred dissent within the ranks of the UDP. However, after Figueroa’s victory, we were informed by a ranking member of the UDP that the party was looking at working out an imminent accommodation to get Figueroa into Cabinet, and on Friday, that was confirmed with an official release from the Office of the Prime Minister, announcing that Dr. Figueroa would be installed in a newly created post: Minister of State in the Office of the Prime Minister. The government’s official release says that Dr. Figueroa will be sworn in by His Excellency Sir Colville Young, Governor-General of Belize, and Dr. Figueroa will also officially take the Oath of Office as a Member of the House of Representatives at its next sitting. 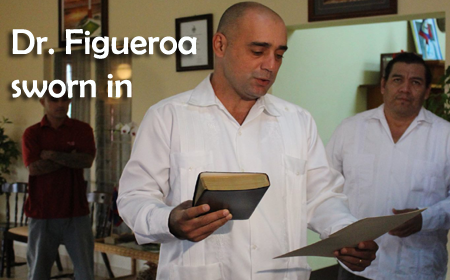 With his installation today, Figueroa becomes the 6th Minister of State in the executive arm of government, and the second assigned to work with the Prime Minister. Caribbean Shores area representative Santino Castillo currently serves as Minister of State in the Ministry of Finance and Economic Development – a portfolio also held by the Prime Minister. Figueroa told us today, when we asked him what his duties and responsibilities would be as Minister of State in the Office of the Prime Minister, that this still needs to be clarified, and he prefers the Prime Minister to be the one to make that announcement. He told us that he attends his first Cabinet session tomorrow, and he should be sworn in sometime next week as a member of the House of Representatives. Figueroa said that he is currently busy trying to get his constituency office set up in San Ignacio, Cayo, where, he said, he intends to spend most of his time. As for his new Cabinet post, Figueroa said that it comes with “a lot of responsibility,” and while he is cognizant of the challenge that lies ahead, he is confident that embedded within them are opportunities to do a lot of good for the people of Cayo North.